Originally a company town, Ruston was first called Smelter until 1906 when residents voted for a change. Established in 1890 for the employees of the Tacoma Smelting & Refining Company, Ruston has gone through more than just changes to its name. In 1993 the iconic smokestack on the Ruston waterfront was demolished and the area underwent extensive environmental clean-up. Now the site is transformed into Point Ruston, home of Tacoma's newest movie theater, restaurants, cafes, and upscale condominiums - all overlooking Puget Sound. 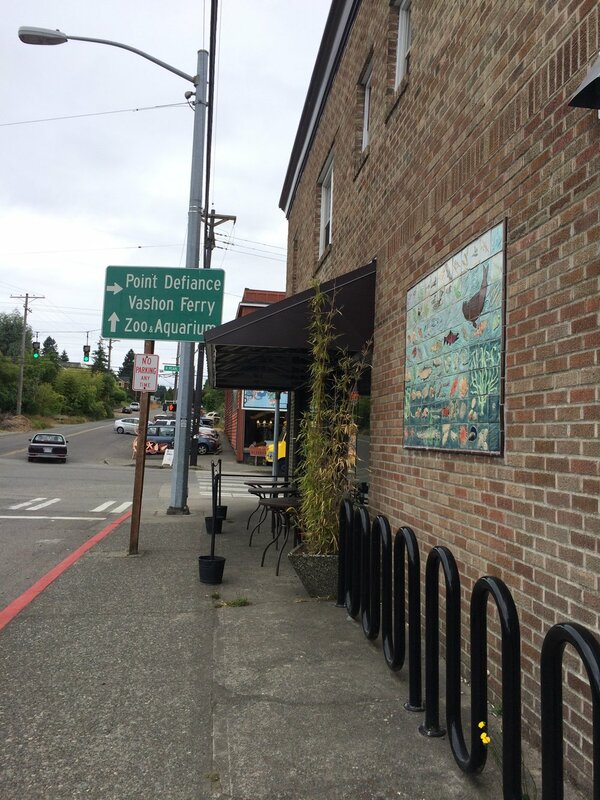 Located between North Pearl Street and the waterfront, Ruston is the doorway to giant Point Defiance Park, which encompasses the 5 Mile Drive, Owen's Beach, the Point Defiance Zoo & Aquarium, gardens, and miles of trails. These days Ruston is known for its small town feel as well as beloved local businesses that have stuck around for decades. 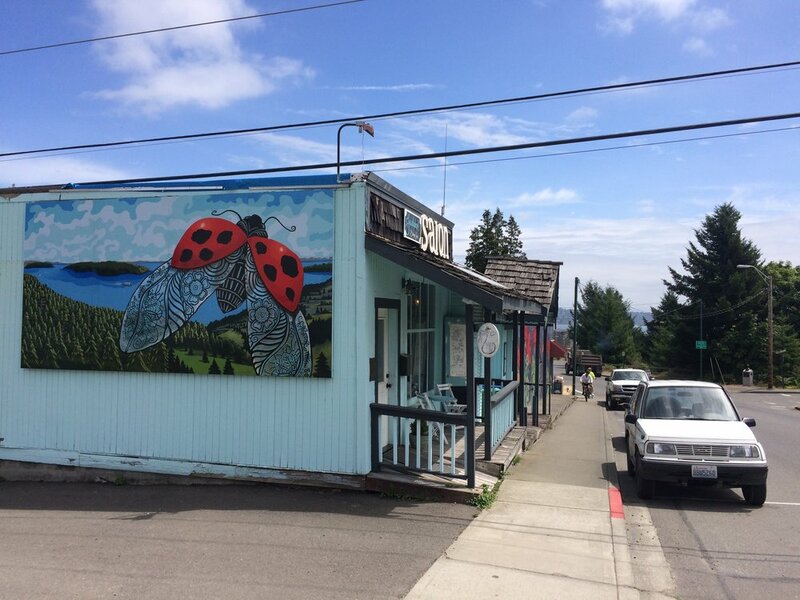 The Town of Ruston enjoys close proximity to Ruston Way, a two-mile long waterfront path with views across Commencement Bay, multiple beach access points, fishing piers, and some of Tacoma's favorite restaurants. Read more about Ruston on our blog! Serving Ruston since 1983, Don's Ruston Market & Deli offers an old fashioned soda fountain experience. Don't forget your ice cream cone! 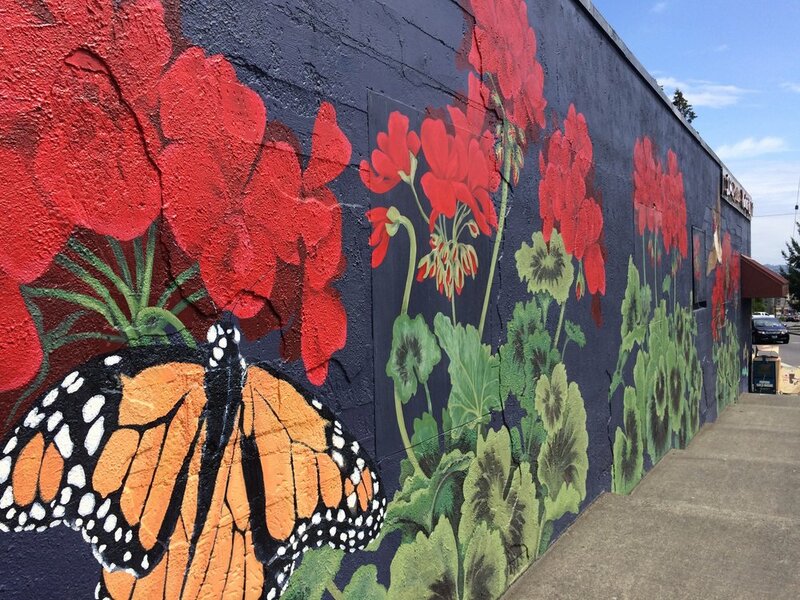 "Ruston Garden" was painted by Rachel Dotson in 2011, just one of the beautiful Ruston neighborhood murals. Find it on the side of Don's Market & Deli. Painted by local artist Mary Mann and her students at SAMI, this mural went up in July, 2016. Located on North Winifred Street. A row of colorful Ruston neighborhood homes, just one street of many in this cozy community. A view west to the waterfront from the bridge on North Winnifred Street. Midsummer morning strolls through the neighborhood are just one reason to live in this pretty place. This nursery located on North Pearl right before you reach the Antique Sandwich Co. specializes in rare and exotic plants. This garden surrounds you with shade and lush green if you give yourself time to head up the sidewalk. Stop and eat at The Antique (you can even sit out under white umbrellas on sunny days), visit Wren & Willow, get your alternator repaired, then cross the street for a beer. Mary Mann's mural graces the south side of The Antique Sandwich Co, going strong as a restaurant and meeting place for the Ruston community since 1973! Welcome to Ruston! You know you're here when you pass Tatanka Take Out on 49th and N. Pearl (bison lovers and vegetarians eat up!). Don't leave Ruston without getting over to Point Defiance Park (you'll like it). You'll love to meet this statue of Ivan on your way down to the zoo entrance from the parking lot. This is a favorite Tacoma beach located in Point Defiance Park. Seashells, rocks, sand, driftwood, seals, birds, and seaweed are just some of the things you'll meet at Owen Beach. Head into the park past Fort Nisqually and wear the dog out at the off leash area. Poodles off leash at the park! The Antique Sandwich Company is an eclectic, cozy, old-timey spot well worth a visit. Explore the garden on paths over bridges and across pools. Bright azaleas and other beauties bloom in the Japanese Garden at Point Defiance in the springtime. Visit The Pagoda in the Japanese Garden at Point Defiance. A walk through Ruston reveals quaint, old fashioned homes with nice little fences and sweet porches. No longer used as a school, this building is still put to good use and standing strong representing the history of the neighborhood.